International? Time travel? Fun in an arboretum? And just who is Gizella Kopsick? Hold on – bear with me – let your mind open up and come on an adventure to the Jurassic world of Africa, Madagascar, Japan, Honduras, Queensland, Cuba, and more. Thorough signage throughout the gardens is helpful, but you can also get a free docent-guided tour which helps you appreciate just how unique the palms are and how rare and old the cycads are. What was once a city miniature golf course which became too expensive to maintain became a two-acre park with around 800 specimens representing 235 species of palms and 100 species of cycads. This two-acre garden is the most international thing in St. Petersburg. There are palm trees from Burma, Myanmar, Vietnam, India, Malaysia, Thailand, Sri Lanka, China, Japan, Madagascar, Mozambique, Kenya, Tanzania, Brazil, and Honduras, just to name a few. It’s an easy lesson in geography – imagine being in that homeland while gazing up at its tree. The size and thickness of the many trees cuts off any view of nearby buildings or noise from the streets making it possible to effortlessly transport yourself to another land. Imagine the Old Man palm, which is endangered and rare in its native Cuba, alongside the Cuban Petticoat palm – a truly outlandish tree, and add the Foxy Lady palm, which is a man-made hybrid tree, but a well-named one! What a trio they make. How about the Puerto Rican Hat palm? No, it doesn’t look like a tree with a hat, but the fronds are used to make hats, baskets, and mats. Or, can you picture the Red Leaf, Red Flame, Red Feather palm from New Caledonia? What do they do with that one I wonder? Well, come for a stroll and see what you can find! Photos on this page: Gizella Kopsick at her 100th birthday party; engraved bricks available at the park; European Fan palm, Bismarck palm, and Coconut palm. The Triangle palm from Madagascar has a fruit much liked by children, and was once used for fermented drinks. Hopefully the kids ate the fruit before it fermented. Look for its three-sided top; it’s really triangular. One huge palm, the Gebang, has a three-foot diameter trunk, and produces the largest inflorescence (complete flower) of any plant on the earth! It has millions of flowers – a sight to behold. Unfortunately, it dies after flowering. Oh sure, there are familiar palms like the Bismarck, actually a native of Madagascar, but have you been close to one that has a width of 25 feet? Wow! 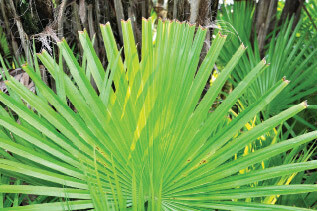 There’s the Cabbage Sabal palm, which is the Florida State tree, as well as the Sabal Palmetto and the Scrub Palmetto, both Florida natives. 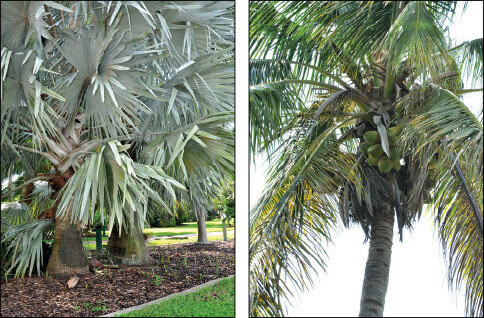 One species, the Paurotis palm, grows naturally only in the extreme south of Florida in the Everglades, but also in our arboretum. And those Foxtail palms that are so popular? They are rare and protected in their native Queensland. Prehistoric cycads (pronounced si-kads), earth’s original seed-bearing plant, lived millions of years ago with the dinosaurs, and yet are right here in the arboretum. You can feel as if you are walking in the Age of the Reptiles, the Jurassic period, 200 million years ago when cycads were common, as were lizards, crocodiles, and the first birds. The most familiar cycads you know are Sagos – those ubiquitous palm-looking bushes called either Queen Sago or King Sago that are all over the place. And lizards and alligators – they’re Florida! It’s easy to imagine a dinosaur just around the corner, snacking on the slender leaves of the Sago, as you stroll among those ancient beauties. The Queen Sago from India, Sri Lanka, Thailand, Malaysia, Indonesia, and S. Pacific Islands was one of the first cycads to be named. Sagos are just a few of the 100 species of cycads in the recently expanded section of the arboretum. In 2014, the City of St. Petersburg purchased 300 rare cycads offered from the estate of Dr. U. A. Young of South Tampa. Dr. Young legally imported cycads from all over the world, searching them out in his many travels. His son, Brad, who is a botanist, continued this legacy when he was a student in 1979, finding the seeds of the endangered ‘Cycas scratchleyana’ atop a tree in a remote Papua, New Guinea village. 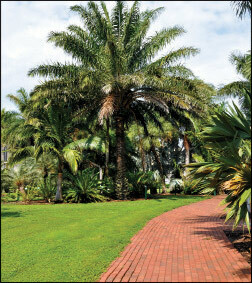 Our 12-foot-tall cycad grew from seed and flourished in Dr. Young’s yard for years. It is now thought to be the only one in North America and is declining elsewhere throughout the world. There is a video on the park’s website of a Bobcat loader moving the plant to St. Petersburg. An 1880’s immigrant from Austria-Hungary who became a chef for wealthy New York families, Miss Kopsick created a legacy for all palm tree lovers with a $16,000 gift of stocks used to establish the city’s palm arboretum. The arboretum was dedicated in 1977 on her 100th birthday. Newspaper reports tell of the wheelchair-bound Miss Kopsick touring the gardens with her nurse and her niece, both during construction and after the opening. Miss Kopsick seems a fascinating but mysterious lady who moved to St. Petersburg in 1962 (she retired in 1935), perhaps to be near her niece, Mrs. Helen Holland. She is mysterious because very little has been written about her, but the few newspaper articles available describe her as devoted to palms and to city beautification in general. According to reports, she not only received a key to the city, but kisses from at least two mayors! Miss Kopsick was also a friend of Mrs. Elva Rouse, a dedicated park volunteer who proposed the idea of a palm arboretum to her. The Elva Rouse Park, near the arboretum, was named by the City in honor of the dedication and commitment of Mrs. Rouse. After moving from Driftwood, she lived in an apartment which overlooked the parks – perhaps that is where the two dedicated women met. And where did this chef, a single woman in the early 1900s, get stock? According to her niece, her employer, industrialist George Blumenthal, advised her, “Don’t buy anything; invest in stock.” She did invest in numerous companies, including Disney Productions – savvy woman! She may have gotten the idea of philanthropy from another of her employers, C. K. G. Billings, who donated the world-famous Cloisters to New York City. Miss Kopsick died in 1980 at the age of 103. This park has been included in the International Palm Society (Kew Gardens in England is another), and was awarded accreditation by the Morton Register of Arboreta, an international registry of public gardens with a focus on woody plants. This international recognition and the visitors it brings from around the world is just another aspect of how international our arboretum is. Now we the public, both local and visiting, benefit from the thoughtful, unselfish gifts of a frail lady chef as well as a curious gentleman surgeon and his son by enjoying freely and anytime, the marvelous Gizella Kopsick Arboretum. And we don’t have to have lucrative stock portfolios or rare inheritances to leave our own legacy. For those inspired by the garden – of which there have been many over the years – there is a gift tree program, whereby a tree is planted on city-owned properties in honor of a person, an organization, or as a memorial. Contributions in any amount are accepted and accumulate toward the price of a tree. Special to the arboretum is a Paving the Future Brick Program whereby your name, organization, or memorial is custom-engraved and placed around the planting beds in the palm garden. All contributions are tax deductible and all proceeds will fund the expansion of the arboretum. 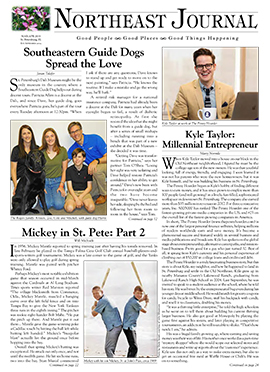 Thanks to articles in The Evening Independent, 1973, 1977, 1979, The Tampa Bay Times 2013, the city website, and Google!